Steam engines were the first sources of power to run mechanical operations that did not depend on the wind, falling water, or human or animal energy. The first steam engine was developed in 1698 by Thomas Savery and was used to pump water in mines. It wasn't until James Watt made some major improvements to the efficiency of steam engines in the late 18th century that they began to be used widely to power machines in factories. 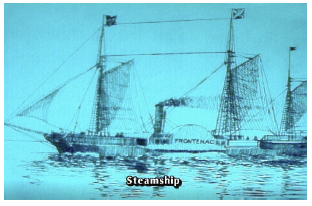 In the early 19th century the use of high pressure steam allowed more efficient, more compact engines to be made which were used to power steamships and the first locomotives as well as factory machines. The use of the steam engine was so widespread in the 19th century and had such impact on the economy and the way things were made and transported that it has been called the Age of Steam.